Dr. Robert Earl "Bob" Smith died April 18, 2012. Born May 12, 1933, in San Carlos, Calif., Bob attended Redwood High, Stanford University and San Francisco College of Dentistry. In 1957-58, after becoming an orthodontist, he worked in dentistry for the U.S. Army in Weisbaden, Germany. It was from there that he traveled to Kitzbuehel every weekend, solidifying his desire to ski. In 1960 he transitioned from the Army to his private practice in Marin County, Calif., specializing in children's dental problems. In 1964 Bob married his wife, Jean, with whom he remained for 48 years. 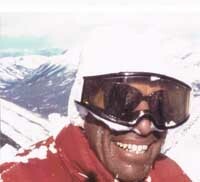 Shortly after that, his passion for skiing led them to Alta, Utah, where weather conditions and fogging goggles were the catalysts for Bob's invention of the modern double-lens ski goggle. With the help of his wife and his orthodontist skills, the two manufactured early goggle prototypes around the kitchen table, ultimately forming the world-renowned company Smith Sport Optics. Smith's design and technology proved to be so effective that the uses have expanded all the way from the ski slopes to the U.S. military. Bob's enthusiasm for life continued well into retirement. As a pilot, he and his wife traveled extensively, seeing the world his way—fast! He was always reading and absorbing information, and there were very few subjects that he was not well educated on. He never lost his thirst for knowledge, taking on every challenge as though it were his first and as important as the last. Bob is survived by his wife, Jean; their two sons Andrew and Colby (Diane); and his four grandchildren, Carter, Finn, Mckenzie and Sawyer. He was preceded in death by his son Carter. We will always remember him as a pioneer, entrepreneur and loving father. He will be dearly missed. Always remember—"It's a Smith kind of day."